Viralys is a nutritional supplement for cats that contains L-lysine in order to manage feline herpes. Viralys pet meds aid in the treatment of the respiratory and ocular symptoms associated with the feline herpes virus. Viralys Oral Gel with L-Lysine is an oral cream that can help treat the symptoms of feline herpes virus. 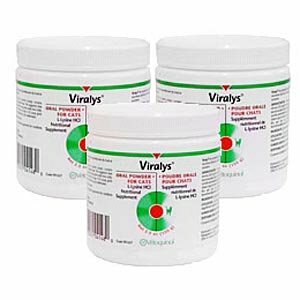 Viralys provides quick relief for common herpes symptoms such as sneezing, excess mucus, eye seepage, tongue ulcers, and loss of appetite. Viralys Oral Gel is easy and convenient to administer, requiring just a quarter of a teaspoon given to your cat by mouth twice a day. The gel is completely safe, and has been approved by the EPA and FDA for use on pets. Feline herpes can cause a lot of discomfort for your pet, and Viralys Oral Gel with L-Lysine will provide them with a quick recovery to keep chronic issues under control. Nobody wants their cat to suffer from a virus, but unfortunately, some cats develop feline herpes and feel the effects, regardless. This virus has no effect on humans, dogs or other pets, but it can be a serious breathing problem for cats, and it can also cause conjunctivitis in feline ocular systems. Vetoquinol Viralys (L-Lysine) Powder (600 grams) meets the needs of a Lysine supplement which is a known help in cat herpes virus treatment, both for respiratory and eye symptoms. As an antibiotic, the powder can be ingested by a cat for systemic treatment and protection, and help control the effects of the virus in the affected feline patient. Packaged in 600-gram containers for multiple doses with one order, Entirelypets.com sells Vetoquinol Viralys Powder in tasty flavors, convincing cat patients to take their medicine without a fuss. This is a good thing since, as any cat owner knows when a cat doesn?t want to do something their fish-hook claws and teeth emphasize the point clearly in case there was any confusion on the matter. While reducing your cat?s stress and anxiety in its home environment will keep the virus symptoms to a minimum, having Vetoquinol Viralys Powder on hand will also contribute to a healthier, furry friend and a longer feline life. It's now easier than ever to provide your cat with the l-lysine supplement he or she needs. 5 of These tasty, poultry-flavored treats contains 250mg. L-lysine treats make it simple to accurately provide the Appropriate dose of l-lysine for your cat. 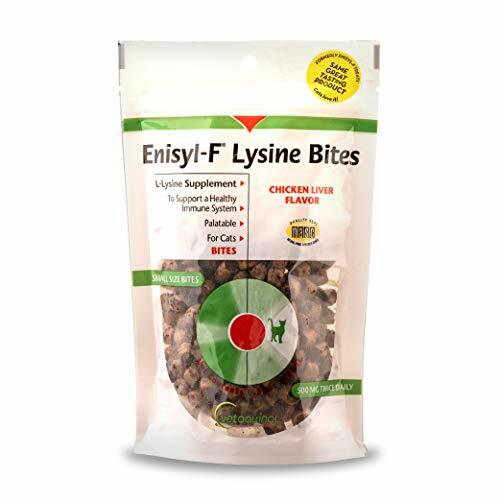 Enisyl-f lysine treats are a palatable source of l-lysine. Supplemental administration of l-lysine has been shown to reduce the severity and duration of feline herpes virus infections. Additionally, routine administration has been shown to reduce the incidence of flare-ups. Enisyl-f lysine treats from Vetoquinol are the perfect l-lysine supplement for your feline friends! Pi che mai la gente di tutto il pianeta si sta allenando ogni giorno di pi. Questo potrebbe sembrare contraddittorio se si pensa che, secondo le statistiche, sono aumentati i casi di malattie cardiovascolari e diabete. Ma proprio per questo che la gente sta adottando misure al rispetto, conoscendo gli effetti devastanti di una cattiva alimentazione e sedentariet. La proliferazione di discipline sportive e la tendenza al fitness sono state motivate in gran parte dall'effetto globale delle reti sociali, che hanno reso virali gli effetti positivi dell'esercizio e del mangiare in modo appropriato. Fitness per tutti i gusti In base alla tua et, struttura, tempo e gusti potrai trovare una disciplina fitness adatta a te. Difatti, ce ne sono persino di personalizzate in base ai tuoi parametri nutrizionali e fisici. Dalla sposa che si sta preparando per entrare nel suo vestito a chi insegue, prima che arrivi l'estate, il corpo da spiaggia di cui sente la mancanza, uomini preoccupati per il loro aspetto e coppie che desiderano mantenersi in salute: tutti possono fare esercizio. Dietary, Viralys Oral Gel For Cats is a L-Lysine nutritional supplement for managing feline herpes virus (FHV.) L-Lysine supplements lessen the signs of infection and reduce viral shedding. Fight back with Viralys. There is no cure but you can get beyond the primary infection and reduce the frequency and severity of recurrences.